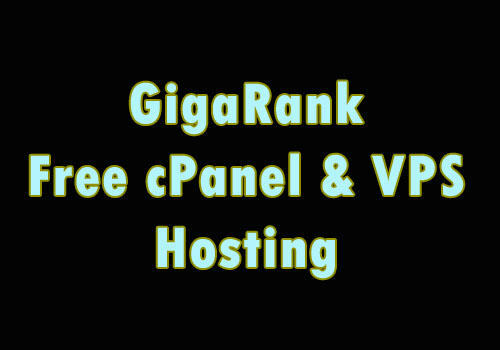 Gigarank is one of the few free hosting providers who offer you genuine cPanel web hosting and even one of those fewer free vps providers out there who actually give a working vps. They maybe not known as Freevps.us but Gigarank has been around since 2013 and their service is even older than that. They are one of my top three free vps hosting providers out there who are really easy to work with. I think many decide not to try them because their rules look strict and I thought same. But in my case I decided to test them see how their service is. I’m happy to say I haven’t been disappointed. What GigaRank offer and requirement ? You can get both cPanel shared hosting and VPS hosting from GigaRank.net. It’s another host or post type (H4P) web hosting provider. First you need to make 10 quality post to request a shared hosting account and this is something you must do even if you want a vps. They want to see if you at least have basic knowledge about web hosting. After than you need another 30 posts to request a free vps. They process your applications pretty fast and you would get your hosting acount without 24-48 hours. Once you receive your vps you need to post 30 post per month to keep it active. It took me only four days to reach 50 posts mark. So you can see how easy to get it done there. Great thing about GigaRank is their forum is very active comparing with other free web hosting forums. You can always find topics to post and making 30 posts per month is not hard at all. I think they have more activity in forum than older forums like freevps.us. Main reason is there are lots of boards in forum to post all kind of stuff. So it’s really easy and fun to post. Also their Staff members are friendly and willing to help you. This is something I usually check before starting to post a forum because if forum staff is not friendly it’s hard to stay in a forum. You only need to make 10 quality posts to get one of their shared web hosting accounts with genuine cPanel. You can use your own domain name or create a free sub domain with their Gigapages.com for your account. You are not getting lot but again it’s free. 1 GB web page is something which makes many users to forget about this package. But when you receive 100 posts in the forum you can request to double this. Means once you have 100 posts you will get it upgraded to 2GB web space and 50 GB bandwidth etc. I think you can upgrade your account several times using this method. If you want a free VPS from GigaRank then first you need to get the shared hosting account and start using then. In forum once you reach 40 posts you can request a free vps. But they want to make sure you know how to handle a vps. So it’s better post the boards related to hosting and show you can manage a vps by your self. Even if you don’t know much about vps still they will probably give you one if you are a good contributing member to forum and explain to staff you plan to learn. You will be getting a 512MB vps and not exactly super fast. This is one downside when a free hosting provide vps by them selves rather than from Sponsors. Their severs start getting slow when there are too many nodes. But again free vps are not huge sites. They have Virtualizor vps control panel which I started liking a lot. One interesting feature it has is option to install six free and paid control panels. I tried ispConfig3 and it works flawlessly!